Named after St. Thomas Aquinas and founded in 1947 by the Basilian Fathers, the University of St. Thomas is the city’s only Catholic university. The charming campus is located in the Neartown District, and with its own gems and vibrant hoods like Montrose, the Museum District, and Midtown all within reach, there is no shortage of fun to be had within walking distance. Note: For the purposes of this list, the walkable area of University of St. Thomas is bound by West Alabama to the north, Richmond to the south, Mandell to the west, and Stanford to the east. University of St. Thomas Academic Mall – Designed by influential architect Philip Johnson in 1957, the Academic Mall is a modern, minimalist space flanked by symmetrical buildings of classrooms that face one another. Unwind on the lawn, which is flanked by the Doherty Library at one end and the Chapel of St. Basil at the other, representing the dual methods of human knowledge–reason and faith. Chapel of St. Basil – Named for 4th-century bishop St. Basil the Great and sitting at the north end of the University’s academic mall, the chapel itself was also designed by Johnson. It provides a serene, meditative space for reflection, with no artificial light inside the main section during the daytime and candlelight at night. Outside, the minimalist design consists of three basic geometric shapes, with a 50-foot white stucco cube as the body of the church, a golden dome sphere and a black granite plane that intersects the dome and the cube. The Chapel hosts mass daily and it seats about 225 people. Link-Lee Mansion – This historic, neoclassical mansion is one of Houston’s architectural jewels, becoming a Recorded Texas Historic Landmark in 2001 and currently serving as the university’s executive office. The 1912 house is located at the corner of Montrose and West Alabama. 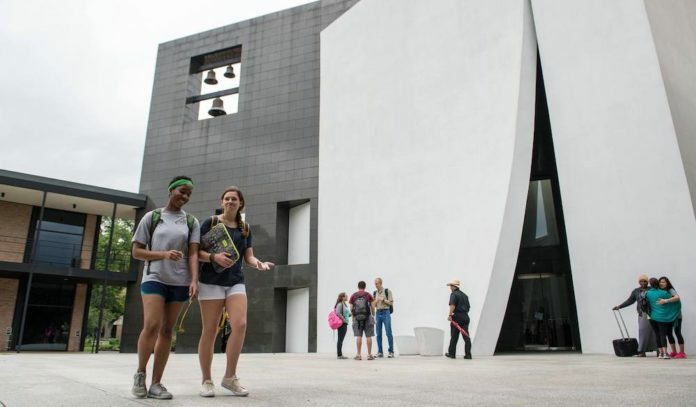 Menil Campus – Just east of the university lies the treasured Menil Campus, which plays home to heavy-hitters like The Menil Collection, Menil Drawing Institute, Dan Flavin Installation at Richmond Hall, Houston Center for Photography, Rothko Chapel and Byzantine Fresco Chapel. BCN Taste and Tradition – A bit east of campus off Roseland, you’ll find one of the finest dining spots in the city. BCN showcases modern Spanish cuisine, from boquerones and calamari a la plancha to grilled Ibérico pork loin and Spanish cod with saffron mousseline gratin. Bistro Menil – Located on Menil Campus, this European-style bistro is the perfect place to unwind with a spritzer. Eats range from charcuterie and cheese plates and salads plump with lump crab and duck confit to truffle butter-smothered N.Y. strip and manchego-jamon pizza. The bistro offers lunch, brunch, dinner, and happy hour. The Black Labrador – This laidback pub – which has the Cezanne Jazz Club upstairs – is just a quick jaunt to Montrose. Head here for traditional English pub grub like fish & chips, Scotch beef, and bangers & mash, plus traditional American pub grub from quesadillas to burgers and buffalo wings. Buff Burger – This local burger outpost sits on West Alabama, offering high-quality burgers made with all-natural ingredients. Get ‘em loaded with goat cheese and truffle aioli, chunky guac’ and piquillo pesto, hand-cut bacon and bourbon bbq sauce, or simply with house mayo and pickles; and don’t forget to tack on the addicting sea-salt fries and classic shakes. Cane Rosso – Over on Richmond, this Neapolitan-style pizza joint offers a pup-friendly patio, plus an excellent set of happy hour and brunch options. Bring friends and share impossibly good, perfectly scorched pies topped with everything from soppressata and prosciutto crudo to jalapeño pesto and Calabrian chiles; and tack on plates of crispy brussels, creamy burrata, and dreamy pappardelle carbonara. Canopy and Woodbar– Head to this chic restaurant for sophisticated-casual eats, from jumbo lump crab omelets and local grass-fed burgers to bucatini pasta and seasonal crostata. Next door, the quaint Woodbar offers coffee, pastries, cocktails, and small bites. Chapultepec Lupita – This Richmond Tex-Mex joint rocks queso, enchiladas, fajitas, and happy hour. El Pueblito Patio – With tropical drinks and an island-style patio, this Latin American-Caribbean spot offers good vibes and good times. Sip frozen tequila cocktails alongside fajitas, parrillada platters, and Caribbean snapper. Good Dog Houston – Good Dog Houston sits right on West Alabama, rocking a lineup of Texas-made dogs with incredible toppings and scratch-made condiments – think beef and chorizo chili, beer-braised sauerkraut, mustard-cheese sauce, and roasted garlic aioli. Enjoy some alongside local crafts and non-weenie dishes like smoked hot wings, fried fish po’boys, and miso green salad. Night Heron – Tucked away on West Main, this neighborhood bistro offers a relaxing patio and indoor seating, with cocktails, brews, and globally-inspired eats from Singapore chili clams and turmeric chicken frites to smoked cheddar burgers and 44 farms sirloin and soba. Lúa Viet Kitchen – Stop in this casual Vietnamese kitchen off West Alabama to fill up on crispy egg rolls, pho, rice and noodle bowls, and local craft brews. The Pit Room – One of the city’s most popular smokehouses sits right on Richmond not far from campus. There, pitmaster Bramwell Tripp fires off a mean smoked brisket, a trio of housemade sausage and unexpected delights like smoked chicken verde and pulled pork tacos, and chicharrones with house hot sauce. Save room for dessert: cherry pie, sugar cream pie, or a next level ice cream sandwich. Revelry on Richmond – Hit this hopping sports pub off Richmond for happy hour or daily specials like Steak & Pint Night (Monday) or Pub Trivia (Tuesday), and grub on everything from braised short rib and poke tacos to patty melts and kale Caesar. Siphon Coffee – This cool coffee shop is located just past Stanford off West Alabama, offering mad scientist-looking siphon coffee alongside classic lattes, daily drips, beer and wine, and café eats from quiche and breakfast tacos to soups, salads, and sandwiches. SweetCup Gelato & Sorbet Originale – Get handcrafted gelato and sorbet flavored with fresh ingredients like mango, coconut, chocolate, beets, and honey. University of St. Thomas Bookstore – The university bookstore offers more than just books, with apparel and accessories, blankets, drinkware and more. Boxwood Interiors – Next to Good Dog Houston, this luxury design store offers design services, bespoke furniture, and lighting. D & Q The Beer Station – Located on Richmond and Stanford, this beer emporium hosts a killer craft collection. Menil Bookstore – Hit this gray bungalow across from the Menil Collection’s main entrance to find a broad range of volumes from the museum’s imprint, as well as an array of contemporary art, architecture, design, and special interest books. You’ll also find a large children’s book and toy section, carefully curated gifts and merchandise, and a special selection of jewelry and artwork by Texas-based artists. The Neon Gallery – Established in 1983, The Neon Gallery specializes in custom neon design, fabrication, and restoration of neon signs and sculptures.